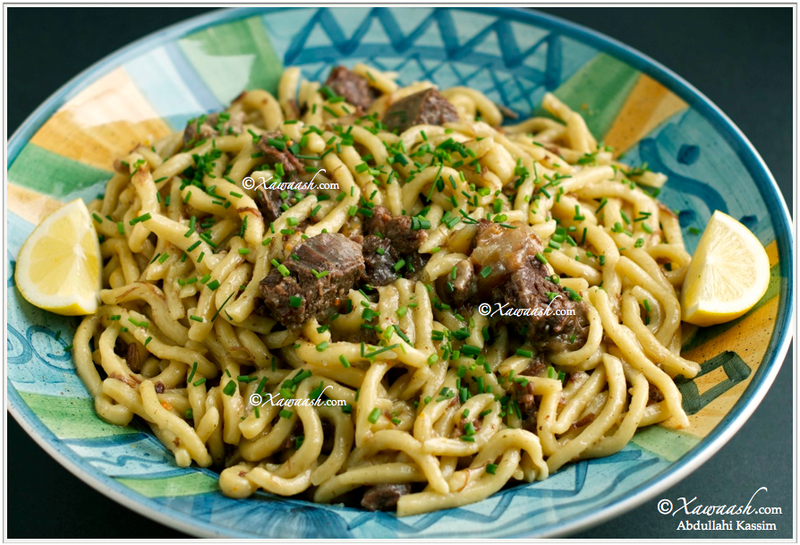 The Chinese have their noodles, the Italians have their pasta, and while they argue about who came up with the idea first, let me tell you about Galaamuddo or Kalaamuddo as some call it. 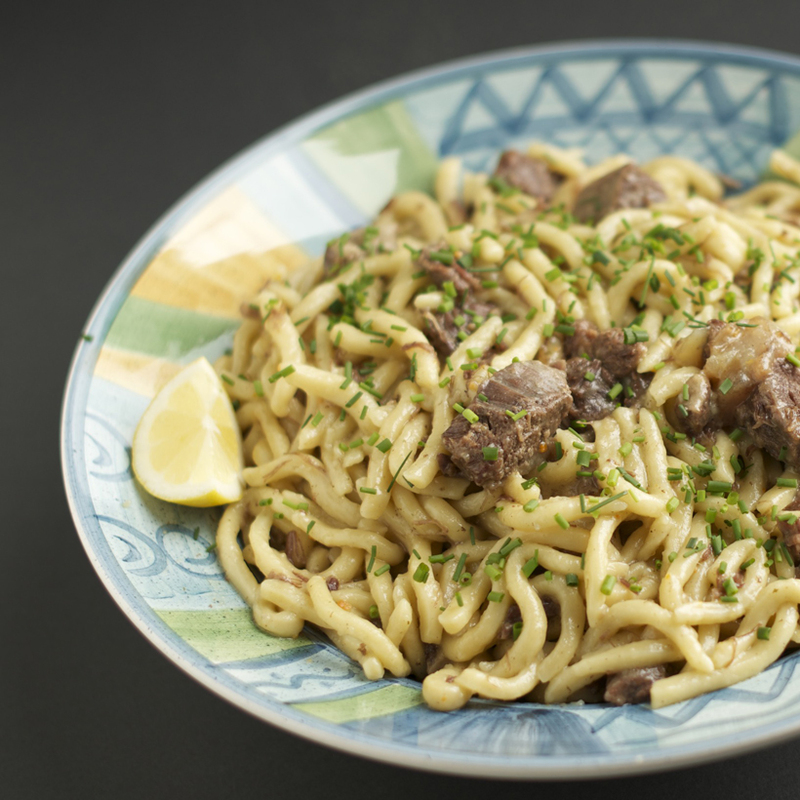 Galaamuddo is somewhat reminiscent of the Italian pasta known as Pici, but there are differences. 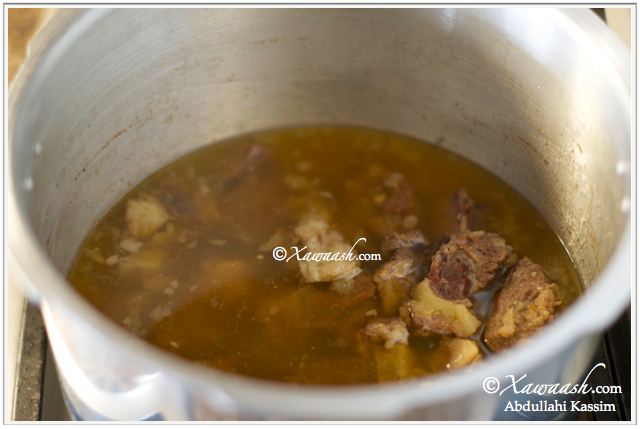 The Bravanese (Brava, Somalia) mix broth into the dough which imparts a flavour to the noodles. The noodles are then cooked in broth providing a second layer of flavour. 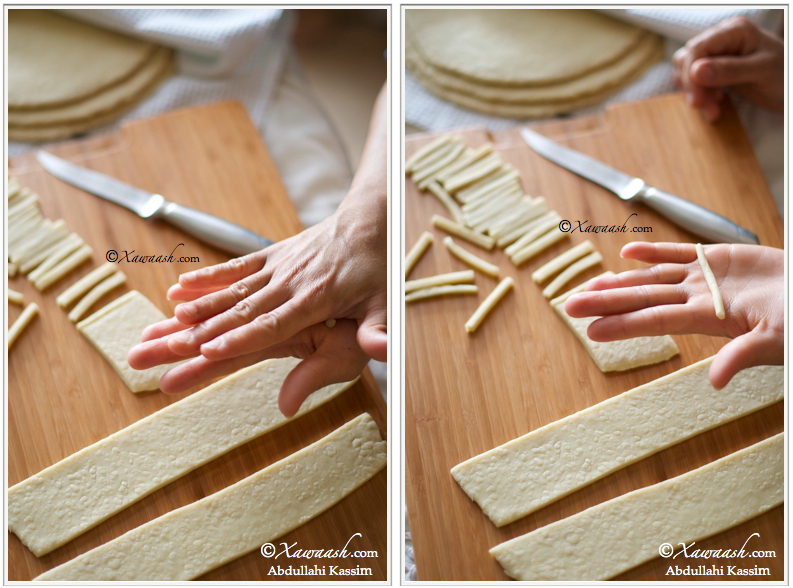 The noodles are also much shorter than Pici and are rolled in the palms of the hands. For the Bravanese, this is comfort food at its best. 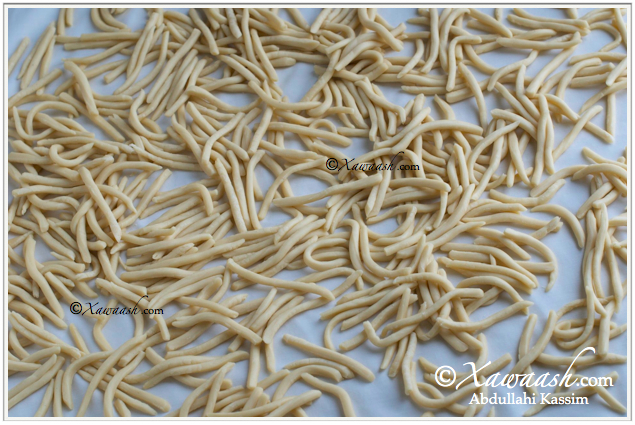 The process of rolling piles of noodles to feed a large extended family is time consuming to say the least. The average Bravanese household had upwards of 20 inhabitants and my paternal grandparents’ house in Brava housed more than 30 people. The task was often turned into an occasion for storytelling, or singing, as family members gathered in a circle around a woven mat, each of them sitting on a low stool (chigaambari) as they rolled the noodles in their hands. 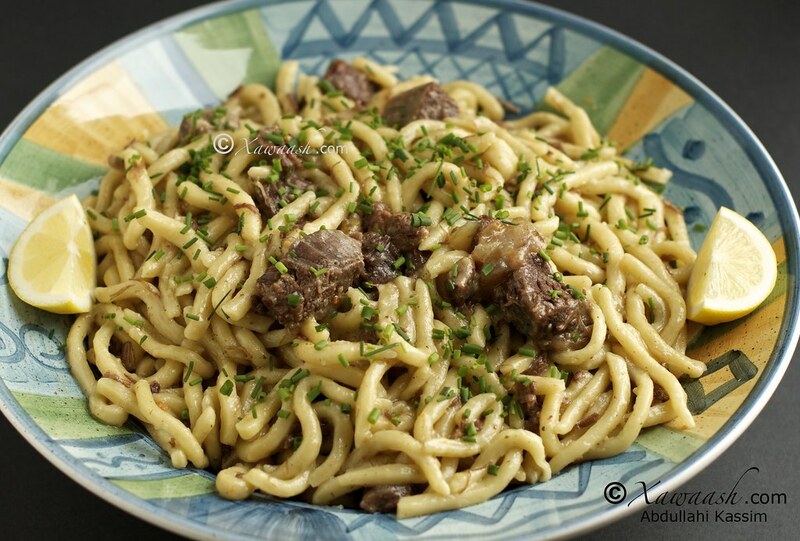 Traditionally, the meat of choice for the broth was oxtail, but goat or lamb are used by some. My mother-in-law, Maedo Bakari, uses vegetable stock for the Galaamuddo dough and then cooks the noodles in a broth made from beef ribs. I had my share of Galaamuddo dishes but none can compare to hers. Period. The following is my mother-in-laws’ recipe, and it is the real deal. Les Chinois ont leurs nouilles, les Italiens ont leurs pâtes, et pendant qu’ils discutent de qui a eu l’idée en premier, je vais vous parler de Galaamuddo ou Kalaamuddo comme l’appellent certains. Galaamuddo rappelle un peu les pâtes Italiennes connues sous le nom de Pici, à quelques différences près. Les Bravanais (Brava, Somalie) mélangent du bouillon à la pâte ce qui donne un parfum aux nouilles. Les nouilles sont ensuite cuites au bouillon ce qui les parfume une deuxième fois. Les nouilles sont aussi beaucoup plus courtes que les Pici et sont roulées à la paume de la main. Pour les Bravanais, c’est la meilleure nourriture maison. Rouler des plats entiers de nouilles pour nourrir une grande famille prend beaucoup de temps, c’est le moins qu’on puisse dire. Le foyer Bravanais moyen était composé d’environ 20 personnes et la maison de mes grand parents paternels abritait plus de 30 personnes. La fabrication des pâtes était souvent l’occasion de raconter des histoires, chanter, pour tous les membres de la famille réunis en cercle autour d’un tapis tressé, chacun assis sur un petit tabouret (chigaambari) pendant qu’ils roulaient les nouilles entre leurs mains. Traditionnellement, la viande de choix pour le bouillon était la queue de boeuf, mais la chèvre ou l’agneau étaient aussi utilisés par certains. Ma belle-mère, Maedo Bakari, utilisait un bouillon de légumes dans la pâte à Galaamuddo puis cuisait les nouilles dans un bouillon de côtes de boeuf. J’ai goûté beaucoup de plats de Galaamuddo mais aucun n’étaient aussi bons que le sien. Point barre. La recette qui suit est celle de ma belle-mère, et elle est authentique. To prepare the vegetable stock for the noodles, stir 1 tablespoon of vegetable seasoning into 2¼ cups of hot water, until dissolved. Add the hot stock to the flour and sugar and mix with a wooden spoon. Knead well until the dough is formed into a ball. If you have a stand mixer, it will make life a little easier. Let the dough rest for about 5 minutes. 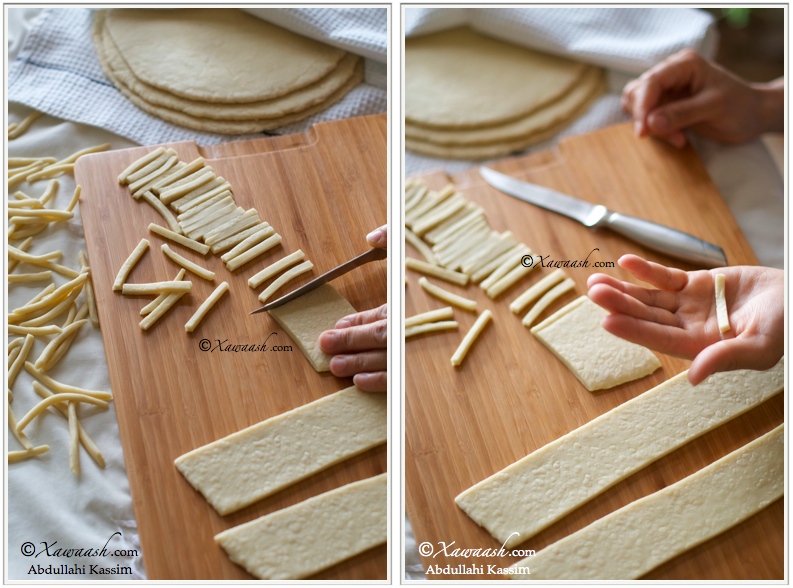 Divide the dough into four and roll each one using a roller. Then follow the steps shown below. Fuudka diyaari: Biyo karkaraaya ku-qas Vegeta (Maggi ama Knorr). Si-fiican u-qas ilaa ay ka-dhalaalaan. Fuudka iyo burka isku qas adigoo qaaddo qori isticmaalaysid. Cajiinka si-fiican u-rifaaq. Muddo 5 daqiiqo dhig. Affar gabal u-qaybi. Raac sawirada hoos ku-yaala. Pour préparer le bouillon de légumes pour les nouilles, mélanger 1 cuillère à soupe de condiment légumes dans 2 ¼ mesures d’eau bouillante, jusqu’à ce qu’il soit dissous. Ajouter dans le bouillon chaud la farine et le sucre et mélanger avec une cuillère en bois. Pétrir la pâte jusqu’à ce qu’elle forme une boule. Si vous avez un robot ménager, cela vous rendra la tâche plus facile. Laisser la pâte reposer 5 minutes. Diviser la pâte en quatre et rouler chaque morceau avec un rouleau à pâtisserie. Puis suivre les étapes ci-dessous. Prepare the broth for cooking the noodles. Préparer le bouillon pour cuire les nouilles. Sauté the onions, garlic, and the spices in the oil. Add the meat and cook for about 2 minutes then add the water. Let it simmer one hour. With a pressure cooker the cooking time is reduced to 20 minutes. Drop the noodles into the broth. Faire revenir les oignons, l’ail, et les épices dans l’huile. Ajouter la viande et cuire 2 minutes puis ajouter l’eau. Laisser mijoter une heure. Avec une cocotte minute le temps de cuisson est réduit à 20 minutes. Verser les nouilles dans le bouillon. 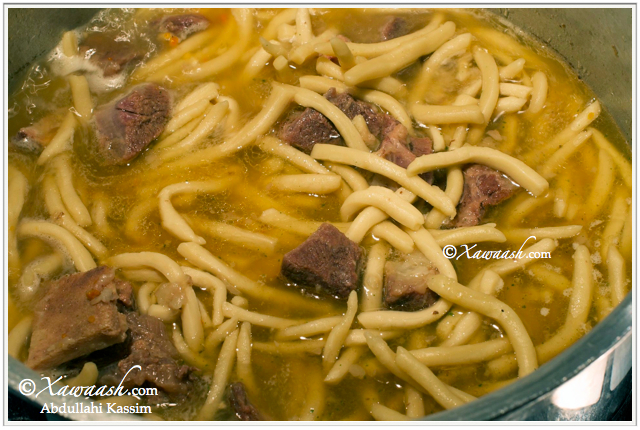 Cook until the stock is absorbed and the noodles are al dente, about 15 minutes. Add hot water if required. Turn off the heat before the noodles dry out. Cuire jusqu’à ce que le bouillon soit absorbé et que les nouilles soient al dente, environ 15 minutes. Ajouter de l’eau chaude si besoin. Couper le feu avant que les pâtes sèchent. ohhh, this looks so good! I’ll save this for a quiet weekend when i have time to do this. If you make a large batch, you can freeze some (in a ziplock bag) and have a quick galaamuddo meal even on a busy day. I’ve been wanting to make this dish for awhile now. Thank you for sharing! By the way amazing website. We also like to add sugar but we thought that some might not like it, which is why we left it out. Thanks for the comment. Maraqa sida aad rabto waad u-karsan kartaa. Annaga waxaan ku jecelnahay hilib lo’aad oo waxyar caddiin leh. Hilib ari-na kuma xuma. Maraq baastada ay ku bislaato ayaa loo baahanyahay inaad ku reebtid hilibka. Haddu ilaahay yiraahdo video ayaan u-samayn doonnaa. Mahadsanid. Waad ku mahadsan tahay faalladaada. Waan soo gelin doonnaa (mayaangaamba) inshaAllaah. Aad ayaa ugu mahadsan tahay faalladaada. 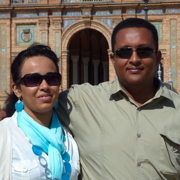 Soo’da Kalaamuddada af-Soomaali ayaan ku-qornay. Mahadsanid walaal. Asalaam Alaikum, I would like to state that this website has inspired in me the desire to cook so I thank you. I had a question in preparing this recipe, can chicken drums be changed for the beef ribs because that will bring about different taste but before I want to have the ok. Thank you for the nice comment. You can substitute chicken for the beef ribs. However, the most important thing to remember is that this dish requires a good broth. The bones from the beef give you a good broth. Make sure that you add chicken or vegetable broth. Hadduu Ilaahey yiraahdo waan soo gelin doonnaa. Waxaa lagu qasay laba koob biyo kulul iyo 1 qaaddo weyn Vegeta ama 2 mukacab Magi. Hilibka sida midka bariiska oo kale ayaa loo kariyaa. Basasha iyo tuunta isku dalac, qorfaha ku-dar, haddaad isticmaalaysid. Hilibka ku-rid laba daqiiqo kaddib biyaha ku-shub. Hal saac karkari ilaa hilibka uu ka-bislaado. Galaamuddada ku-rid kari ilaa biyaha uu ka-gursado. Hadduu Ilaahey yiraahdo video ayaan samayn doonnaa. Mahadsanid. i love Kalaamuddo so much even though i dont knw how to cook Kalaamuddo but this one looks amazing, i was wondering if u could make a video of how to do Kalaamuddo? God willing, we will post a video on how to make Kalaamuddo. Thank you for your comment. Yummy! !!!! Delicious. sweet memories of back home dada’s house. Mashallah tabarakallah you guys are amazing! Thank you very much for your kind words. We are happy you like it. Could you please put this recipe into a video, i like your videos and i tend to follow better Thank you. God Willing, we are planning to make a video for Kalaamuddo. Please, be patient. Thank you for your comment. mashallah, amazing. thanks for sharing it all, always wanted to know how to make kalaamudo. waad mahadsantahay, superb aa tahay mashallah, can’t wait to try it out. That was good ,inaa sameeyo iskudayaaya next time………..You are amazing.